Interracial Single Online is the Meeting Place for Singles of All Races. Singles from All Over the World Meet and Mingle at Interracial Single Online. Every year, thousands of interracial couples find each other through InterracialSingleOnline.com. If you are among the thousands of singles seeking to meet, become friends with and date members of another race, Interracial Single Online is for you. 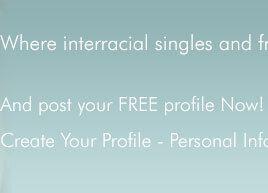 We welcome singles from all races, ethnicities and cultures to join. Sign up for free today and create your profile. Search the site and meet singles in your own area and across the world. Free to place liftetime ads! © Interracialsingleonline.com powered by InterracialMatch.com 2001 - 2019. All rights reserved.